Blue Naped Parrot, is an uncommon bird,becoming rare on the Philippines except Subic Bay,Palawan and Sulu Islands.It´s found in forest and forest edge in pairs or noisy groups.It´s a green medium-sized parrot with red bill,blue nape and long tail, that you can see easily all around the Forest Reserve, usually hanging on fruiting trees.Fortunately it s common in Subic Bay,usually seen single feeding on fruiting tree. Guayabero is a common endemic bird in forest and forest edge below 1000 m.It s a small green parrot with a short tail, blackish bill,yelowish rump and blue or yelow collar.It´s usually found singly,in pairs or in groups feeding on a tree.It flies very fast and it´s commonly seen in Subic. Green Raquet-tail is an uncommon philippines bird that inhabit lowland forest and edge up to 1000 m.It´s the smallest raquet-tail and it hs a green plumage with short rackets.It usually travel in pairs or small groups and can be seen foraging in the canopy or understorey.It ranges from Luzon to Marinduque.Populations are declining rapidly and almost disappear in Sierra Madre and Quezon national Park.Fortunately it s a common bird in Subic,seen many times along the road. Coleto is a near endemic and common bird found in forest, forest edge, and second growth in almost all the Philippines.It´s black except a pinkish area on head,a grey mantle and a whitish grey rump.It perches in open on exposed dead branches.It travels in pairs or small groups and feeds on fruits and insects.In Subic, it´s usually seen exposed on electric wires. 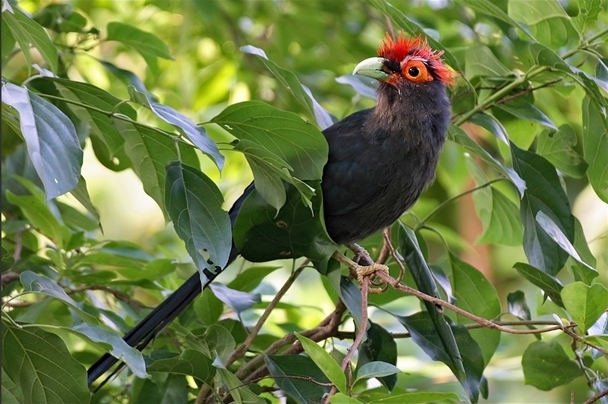 Red-crested Malkoha is another endemic and common bird seen frequently in lowland forest and forest edge.It has a typical black plumage,red crest and pea green bill.It usually appears singlyor in small groups in the understorey, skulking in dense foliage and vines.In Subic you can see it on the forest and quite often near the main roads. Tarictic Hornbill ,is one of the endemic hornbills that inhabits in the Philippines.It has a black plumage on its back and whitish below.It´s fairly common in forest edge up to 1500 m.It perches on exposed branches and and appears in pair or small groups.It´s a noisy bird that it´s common to spot on early morning and late afternoon. Philippine Falconet is a common bird quite common all around the Philippines except Cebu.It s a small and very cute falcon with its unmisteakable black and white body.It usually perches on dead trunks or trees on exposed branches.It s common in Subic. Spotted Wood-Kingfisher is an endemic kingfisher founded in lowland forest understory.It´s fairly common and unmistakable as well.This beautiful bird has a spotted body with a typical black eyestripe,dark green cap,torquoise border around nape and above eyestripe, in the head.It´s noisy at dawn and usually appears singly or in pair.It perches motionless in dark recesses. Philippine Trogon is a beautiful bird and the only trogon that you can find in the Philippines.This endemic bird is common and found in forest and secondary growth up to 2000 m.Its size is about 25 cm and is unmistakableIt has a red belly, whitish chest,dark brown head with an orange bill, and brown back.It perches alone or in pairs on the top branches of dead trees usually in lowlands.It´s more harder to find on the wet season. 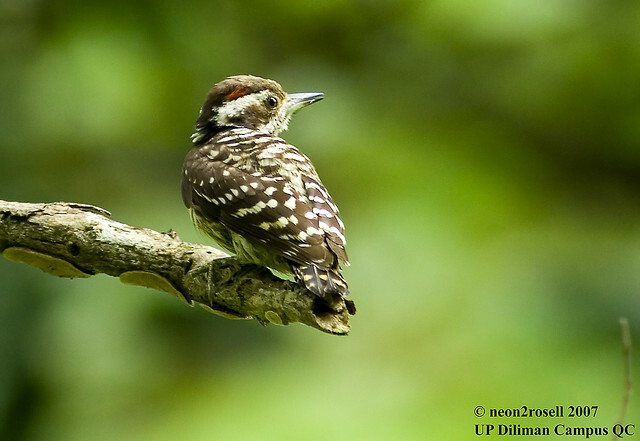 Philippine Pigmy woodpecker is a small endemic and common woodpecker that inhabit lowland and montane forest and edge.It´s the smallest Philipine woodpecker and it´s unmistakable because of its size and streaked underparts.It travels on mixed flocks foraging up branches and trees.They usually appears near the main road of Subic early in the morning. Rufuous Coucal is another great bird to see.It´s a brownish bird with a green and yelow tip bill.It´s uncommon and inhabits the understore of forests,usually bamboo and thickets.It appears in small groups of up to 12 birds.It´s a noisy bird that is always moving among the sticks but however,it s hard to see because it moves very fast. White-browed Shama is a lowland forest bird usually below 100 m in second growth and primary forest.It has a white breast and belly and blackish back with its typical long white eyebrow.Conspicuous by its loud and melodious song but hard to see .It appears in forest undergrowth.In some parts of Subic forest can be seen. Red-bellied Pitta is a shy and inconspicuous pitta that inhabits forest and secondary growth usually below 1000 m. It ´s dark blue on the upperparts and has a red belly.It appears on or near the ground and it s very vocal at certain times of the year, singing on exposed rocks or stumps or high up in the trees. Indigo-Banded Kingfisher is another great and beautiful endemic kingfisher.It´s n uncommon bird restricted to clear freshwater streams up to 1500m.It looks like Common Kingfisher but it has a darker head,wings and tail and a bluish breast band.It perches on rocks or on branches.It flies quitely and very fast.It can be seen in MBA gardens in Mount Makiling. Wattled Broadbill, is the only broadbill that you can find in the Philippines.This endemic bird inhabits in Bohol, Leyte, Samar and Mindanao.It´s uncommon and local in forest understory below 1000m.It´s unmistakable.It usually appears solitary sitting still on exposed perch or travelling in groups with a mixed flock. 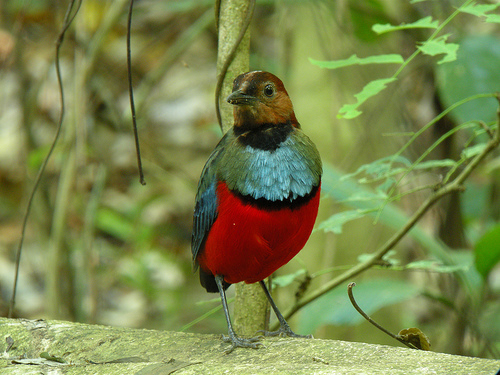 Steere´s Pitta is one of the two endemic pitta found in The Philippines.It´s uncommon and local and inhabits in Mindanao, Bohol, Samar and Leyte.Its habitat is lowland limestone and virgin forest below 1000 m.It´s a stunning pitta with a black head,bright metallic blue rump and wing coverts,azure blue breast and blanks and scarlet lower belly and undertail.It moves on or near the ground.It s not shy and usually sings on the middle storey.It´s easier to see on the wet season. Rufuos-Lored Kingfisher is an uncommon endemic bird found in Bohol, Samar,Leyte, Cebu, Negros, Siquijor, Mindanao and the small islands on the nearbies.It inhabits forests and forest streams,usually bellow 1000 m.It´s dark blue and and black above,and white or buff bellow,and rufuous on lores and collar.It´s often heard but hard to see.It usually perches on branches on the top of the trees. Silvery Kingfisher is another endemic and uncommon kingfisher found in small rivers and lowland forest streams below 1000 m.It has a black and white body with red legs and feet and grey bill.It perches on rocks and low branches.It´s often seen on the nearbies of Sikaturna National Park. 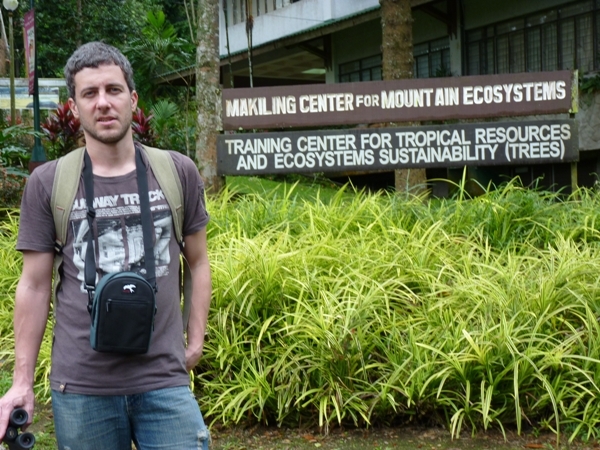 Mount Makiling is a forest area well-managed by Los Baños UP that hosts a remarkable number of Philippine endemic bird species. It s located on Laguna province, in Luzon Island and rises about 1050 m.
After arriving in Clark i was very excited to visit this place for my second time.I got into a bus to Cubao main station in Manila and after I went by another bus to Calamba.Once there i got into a jeepney to UP Campus Los Baños and went by another jeepney to the Forestry.Once you stop on Forestry,near the entrance of Mount Makiling,i found accomodation at Tree Hostel,the only available hostel inside the UP.Accomodation is simple but reliable.The price is 700 pesos per night ( about 13 euros ). Beds are not very confortable but there is a wifi area and rooms are provided with air-con. Firstly I went to arrange transportation for next day. I talked to a motorbike driver at the main gate and we arranged a trip to the top of the mountain for a modest price, 200 pesos, go and come back ( about 3 euro ). After lunch at the UP canteen, i start to do bird watching. 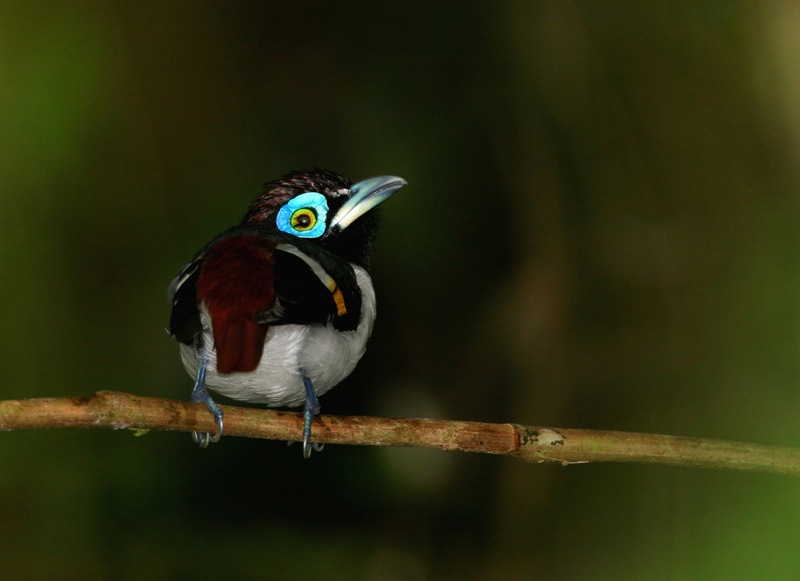 The weather was not good but i was lucky enough to spot a pair of Philippine Falconets and Striped-sided Rabdornis in front of the hotel, on a dead trunk.A heavy rain came very soon, so I had to spend the rest of the afternoon at the hotel. Next morning I wake up very early, at 6 o clock. The weather didn’t improve too much but I expect that after one hour the heavy rain would stop.We went to the top of the mountain through a rocky track until almost the top of the mountain but due to the rain was going on I decided to came back to the food stalls, beside the Mount Makiling Forest Park Area. After having breakfast and waiting for a long time I decided to come back to the hotel. We spend all day in the hotel and I was getting on my nerves due to the rain. Fortunately on late afternoon the rain stopped and I got into a jeepney to UP campus to do our first checking. Around 5 o clock I could saw a pair of Red-keeled Flowerpecker on a tree without leaves. There is a small river near the campus where the water is dirty but we discovered that is an excellent place for finding bird species. White-throated kingfisher and Red-crested Malkoha were seen easily around this area. 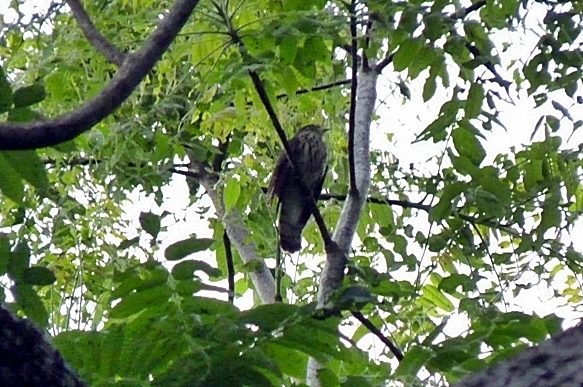 And around 5:30, near dusk, a Hodgson´s Hawk-Cuckoo appeared and perched on a branch. Unless my presence this unconspicuous bird let us take some good pictures for a long time. My first birding was not as I expected but I thought that next day would be a sunny day, and a sunny day after a heavy rain means good bird activity on the tropics. Fortunately for me next morning rain stopped and the day was bright and clear. I wake up very excited and our driver was waiting for us on the main gate.Walking to the main track,near the guard station, I found a Philippine Hawk-Owl perched on a electric pole at 5:30 am and after checking its nearbies, it flew to a tree. After 20 minutes ride we stopped again on the food stalls and I started to do bird watching around this area. I could spot Balicassiaos, Scale-feathered Malkoha and Red-crested Malkoha here around 7 am. Afterwards I continued our trip to the top of the mountain, but birding was not good there so we came back and stopped at the mud springs sign. Around there I followed a trail and I found Guaiaberos, Scale-feathered Malkoha, Balicassiaos,and Philippine Bulbuls. 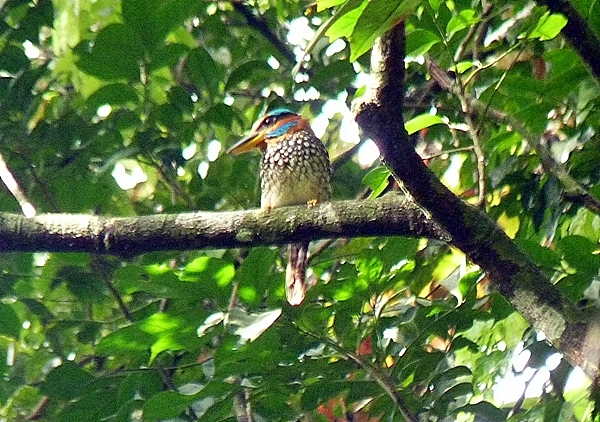 When I was going back to the main gate we stopped on half way and I met a Spotted-Wood Kingfisher,a stunning endemic bird,perched on a tree near one side of the track.It has a remarkable size and colourful blue and orange stripes on its head.I was overwhelmed for the beauty of this five stars bird !!!! Around 9 am I had breakfast and I went to visit the MBG Garden, where I saw an Indigo-banded Kingfisher on my first visit, in 2009.It was Sunday and the gardens were crowded of students. 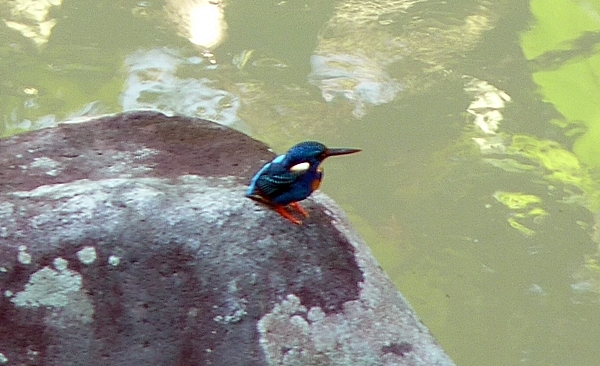 As I expected the Indigo banded Kingfisher didn’t appear along the small stream. After riding a jeepney to UP Campus I came back to the small river. Fortunately I enjoyed the sight with a pair of Indigo-banded Kingfisher fishing here around 1 o clock. One was fishing on a rock while the other one was watching out on the side of the river. Fortunately for me they spend long time doing their duty careless with my presence. I could take some pictures but my 400 mm zoom was not enough for the relatively long distance of these gorgeous pair of birds!!! 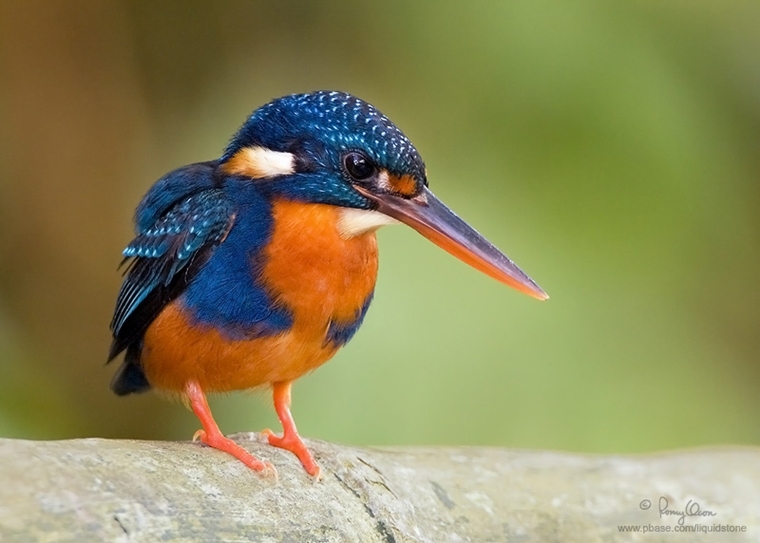 Indigo-banded Kingfisher is an unmistakable small-sized kingfisher that has 2 blue bands on its orange breast.It usually inhabits clean streams or small rivers but surprisingly these couple are adapted to this river. Brown Shrikes, Red-keeled Flowerpeckers, Yellow-vented Bulbuls, White-throated Kingfisher were common birds that I saw around the UP Campus. Around 5 o clock I spotted a Scale-feathered Malkoha, Philippine Bulbul, a shy Plain Bush Hen walking on the side of the river, and an Indigo Banded Kingfisher perched on a rock of the dirty river. This day was great for me and I still remembered the amazing view of a Spotted Wood Kingfisher on my mind!!! 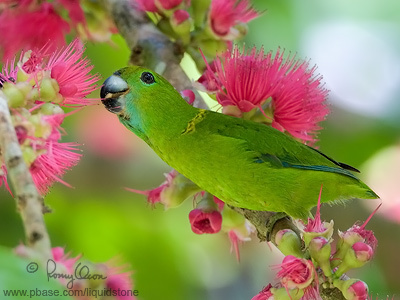 Bird watching in Mount Makiling is not as easy as in Subic Bay but these hotspots were excellent places to enjoy birding!!! Anyway I had a great time there and willing to do my next bird watching report from Palawan Island!!!!! Crows are among the most inteligent birds of the planet.Crows and ravens often score very highly on intelligence tests. Certain species top the avian IQ scale.Wild hooded crows in Israel have learned to use bread crumbs for bait-fishing. One species, the New Caledonian Crow, has also been intensively studied recently because of its ability to manufacture and use its own tools in the day-to-day search for food. These tools include ‘knives’ cut from stiff leaves and stiff stalks of grass. Another skill involves dropping tough nuts into a heavy trafficked street and waiting for a car to crush them open, and then waiting at pedestrian lights with other pedestrians in order to retrieve the nuts. On October 5, 2007, researchers from the University of Oxford, England presented data acquired by mounting tiny video cameras on the tails of New Caledonian Crows. It turned out that they use a larger variety of tools than previously known, plucking, smoothing and bending twigs and grass stems to procure a variety of foodstuffs.Crows in Queensland, Australia have learned how to eat the toxic cane toad by flipping the cane toad on its back and violently stabbing the throat where the skin is thinner, allowing the crow to access the non-toxic innards; their long beaks ensure that all of the innards can be removed. Recent research suggests that crows have the ability to recognize one individual human from another by facial feature. STUNNING MALE OF LYREBIRD !!! Here is a stunning a male of Lyrebird displaying its courtship to atract a female !! !